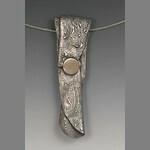 I’m delighted to report that I have three pieces in the current Members Show at the North Hills Art Center! The pieces were hung as they were accepted last week, but the official “opening” of the show is Saturday, September 9, from 7 to 9 pm, and runs through October 6. As usual for NHAC, the majority of the entries are paintings. 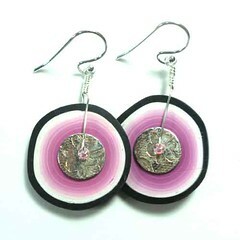 But when I dropped off my art jewelry, I did see fiber art, pottery, mixed media assemblages, and more too! A lot of the pieces were made by students of the center so, if you’re curious about that, this show can also give you an idea of what you might be able to learn in the classes there. If you’re in the area, I hope you’ll stop by to check it out! It would, of course, be great to see you at the opening on Saturday but, if you can’t make it then, do go whenever you can. I’ve already said a few things about each of my entries, separately, in earlier blog or Facebook posts, but I thought I’d assemble a few thoughts on each of them together here. They are all available for purchase at the show. If you look closely, you may notice that the flowers in this “rose bronze” bracelet are Green (nephrite jade), White (cubic zirconia), and Violet (amethyst). Embellishments in those colors were a code in Edwardian / Art Nouveau times for Give Women the Vote! This piece was made before either of my other two in this show, but since then I’ve been holding on to it myself. This is the first time I’ve ever really considered putting it up for sale! As one of the earlier pieces I made with EZ960 after its introduction in 2016, this was made as a class sample, to illustrate the draping/folding process. But it’s notable to me because it’s the first piece I made using only “scraps” from earlier projects. Obviously, that test was successful! In draping, sometimes the material tells me the shape it wants to form, and that was definitely the case here! The title of Night Moon comes from how, once the piece was completely finished, it suddenly struck me how much it evoked thoughts of a particular night in June of 1988 (a truly wonderful summer! ), when I was climbing (well, at that point, descending) Emeishan, one of the four sacred Buddhist mountains in China. 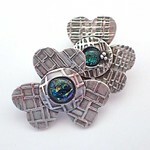 Yes, this is yet another piece from my Urban Flowers series! 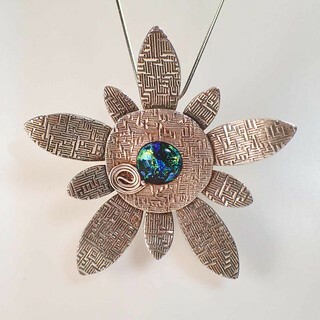 Like the earlier ones, this pendant was made using sterling (.960) silver for most of the piece, for strength, and in a separate step the dichroic glass cabochon was attached with fine (.999) silver because that form plays better with glass. 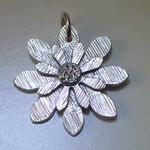 It hangs on a sterling (.925) silver chain. 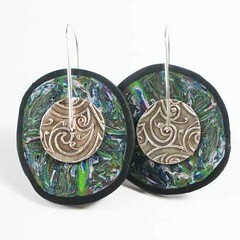 The dichro in this piece is a cabochon made by local glass artist, Elise McVeigh. It is also one of the priciest pieces I’ve had in a show in a good while: that is because, at something like 75 mm across, it is one of the largest pieces I’ve made in a good while too! And big uses a lot of silver, so the price simply reflects that. But Elise’s lovely glass is noticeably different from the other dichro cabs I’ve added to my earlier urban flowers, and I just thought it deserved to go into a “statement” piece! I hope it will find a new home with someone who agrees with me. 2017 Arts on the Riverwalk – please vote! UPDATE: Voting ended at 5 pm on September 9. I didn’t mount quite a big enough Facebook campaign (which really isn’t my style anyway) to claim the $100 people’s choice prize but, as of the last time I was able to check (an hour-ish before the deadline), I had garnered well within the top 10% of votes. So I sure do appreciate the support of everyone who took the time to enter a like-vote on my behalf! Oh, and the exhibit remains on display at The Confluence cafe through October 26. I’ve got two pieces in the Arts on the Riverwalk competition, and I’d sure appreciate your vote! Now, I’ll admit, neither of these pieces were originally made with competition in mind… They were designed as samples for two different classes I taught last fall, and my intention was to illustrate specific technical strategies of construction! In my classes, I also point out that sometimes a design will take a while to tell me what it really wants to be; in the case of these two, they have also taken a while to tell me what they want to be called! 1. 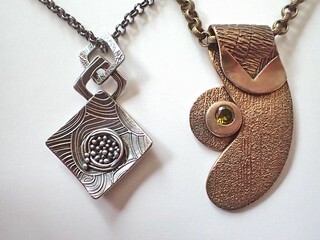 In the pair shown here, the piece positioned towards the left, with a silver pendant on a gunmetal chain, is now titled Overflowing Nest. In the class where I taught that, we covered a range of different “nest-style” constructions, plus I threw in a “bonus” on making links. Time constraints meant I could only illustrate using links this way, as a bail, but the same techniques work for making an entire chain. 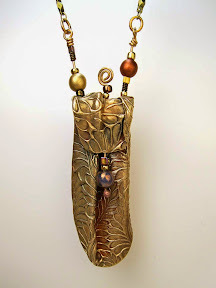 The other interesting thing about this piece is that it was made for one of the first classes I taught using “EZ960” sterling silver metal clay, and it was made entirely from reconstituted “scraps” that were left over from earlier samples. It’s always good to learn how well different clays do or do not reconstitute, and this sample worked wonderfully. If you’d like to vote for my “Overflowing Nest” piece, please click to find the instructions here. I immediately reversed my plan of which side would be the back or the front, because the place where I’d overshot the texture has that lovely angle-into-smooth look that I just had to put on the outside-front, not tucked under in the back. Since the remaining demonstrations I had planned involved layering elements and how to add a fire-able stone (in this case, a peridot-colored cubic zirconia), I made use of the curve of the piece to embellish it with a piece where I could also talk about design issues for centering, or not centering, any embellishments. Ended up being a very interesting, if unplanned, answer to the original question! If you’d like to vote for my “At a Bend in the River” piece, please click to find the instructions here. Also, though I don’t have these specific classes scheduled (yet) for this fall in either of my North Hills or South Hills venues, there’s still time to add a workshop or two in my East End studio. So if you’ve been inspired enough by one (or both) of these to want to learn how to make something like that yourself, please let me know and we can talk about our options! More on other shows, classes, and more, as soon as I find the time for another chance to post here. 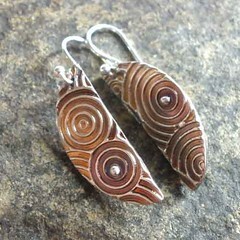 I just learned that I have been accepted for membership in the Cranberry Artists Network. Relatively speaking, this one was fairly easy for me. While they do have a regular screening process (similar to the one I recently described going through for the Pittsburgh Society of Artists), I was admitted through an alternative route: though I still had to do the paperwork and such, and wait until their next screening date, I didn’t have to do all the travel to drop pieces off and pick them back up. Instead, my application was judged based on pieces they’d already seen, when I’d managed a last-minute entry into their Isn’t It Romantic show in February. I am delighted to have this group offer me recognition as an artist, and look forward to participating in some more activities a little to the north. going home to await word on the decision. I delivered and set up my display a little over half-waycoter through the drop-off time period. (From the number of pieces I saw and what I’d heard to be the number of applicants, I do think that the majority of entrants had already delivered and departed.) Once my pieces were all in place, I took a few minutes to look around at the other entries. While many of them were very impressive, there were two artists whose works I was particularly curious about. I actually got to talking to one of them at pick-up time: Ashley had singled out my work as she’d surveyed both rooms too! We were definitely in the minority, having submitted “3-D” pieces for evaluation, rather than 2-D. Turns out, though, that another link is that we’re both members of the Koolkat community (though we don’t remember ever having met at various events there), soon to have our pieces transferred over to The Artsmiths of Pittsburgh once that place opens this summer. Of the three pieces I submitted for screening, the one shown here is the only one for which I can find a decent picture right now. I started it late last year, and it was the first piece I completed this January, but had held off posting about it because I was “saving” it for when I’ll talk about some new workshops I plan to write about shortly. Since I have a couple other pieces in the works that I can use to talk about workshops, you get to see this one now. Anyway, I did not have to wait toooo long: around 8 that evening an email came in saying, “Congratulations! You have been accepted into the Pittsburgh Society of Artists!” I feel very honored to have been selected as a member of this group (and happy that they accepted Ashley too). 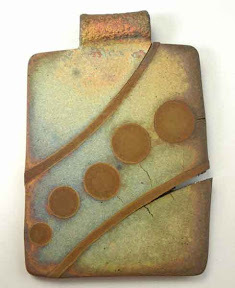 … but bronze and copper shrink at different rates that sometimes yield surprises. If it had turned out OK, I’d’ve been torn: should I polish it up to an even, satin finish, or just leave it with this colored, antique look? I can try to patch it but then, for several reasons, it’s almost guaranteed I’ll have to polish it. That’s ok. I was, however, making it in the hope of meeting a deadline that I’ve now missed, so I’m going to Plan B for that and will set this one aside for the time being. I’ll come back to it later on. There’s a story behind the design, that I’ll tell when I’ve worked it all out. But this is such a dramatic image, I couldn’t resist posting it. (FYI, this piece is the reason I’d mixed up a big batch of bronze, whose leftovers I described in my past few posts.) Sigh. Neither of my entries won a prize in the Show Me the Love challenge but I still wanted to post a quick thank-you to those who did vote for my pieces. 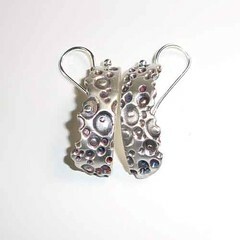 You can see the winners over at the Metal Clay Today website. Second place went to the one I would have put at the top myself. (Even though it came in second, I was glad to see it earn a prize.) The third place price went to the only one of the winners that I actually know. (I enjoyed meeting her at the PMC Guild Conference at Purdue last summer.) I was impressed by many aspects of the piece that earned the first-place prize; although for this particular challenge I wouldn’t have rated any pet reliquary first simply because, while I certainly do appreciate its “love” sentiment, that just didn’t cry out “Valentine’s Day!” to me. But that’s what “elections” are all about, isn’t it? Sorting out the differences among all our opinions. Although it does not say this explicitly at the Metal Clay Today website right now, I am expecting that images of all the entries will appear in MCT’s Spring 2011 issue once it’s made available online. Thus, if you missed voting during the time the poll was open, you should still be able to catch all of them a bit later on. If you notice any artists whose work you particularly like, why not see if you can find them online and let them know how you feel?! 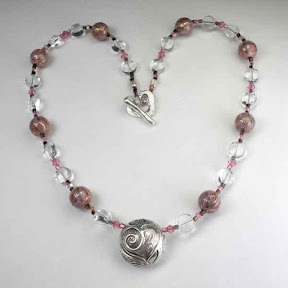 Oh, and the photo that accompanies this post is one image of another love-themed bead I made, I think it was last autumn. 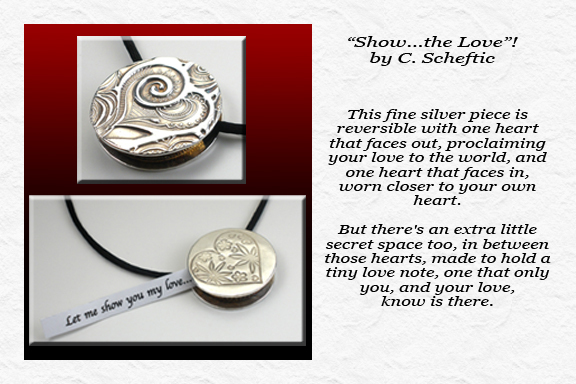 I considered entering this necklace in the Show Me the Love Challenge at Metal Clay Today but, in the end, decided not to. “Lentil beads” are fairly common fare in the metal clay community: beautiful (I think) and great fun to teach (lots of “bang for the buck” in general, but especially for a beginner project) but even adorable ones are not very likely to win a competition any more. If you’ve known me and my jewelry for a while and this bead somehow looks familiar, this may be the fourth, or is it fifth?, iteration of how I’ve strung it. I’m getting happier with each new attempt and, with this one, I like the little reversible heart-shaped toggle clasp I (finally!) made to go with it. I think it’s at last time to put it up for sale. 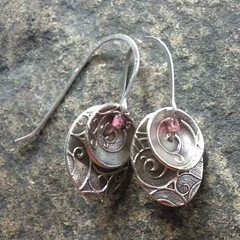 A few days after the end of the Month of Earrings Challenge, I was talking with another artist about combining various other materials with silver. I thought I’d quickly pull up my summary photo and point out a couple examples. Imagine my surprise when I looked at it, and couldn’t find in it my first couple of entries. Yikes! But, no crisis: I had enough other examples scattered around various places that I could use for the purpose of our conversation. 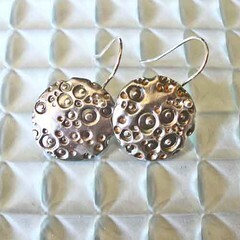 The photo on the left shows the side with circles, plus a little silver ball embellishment in the center of one set of those circles on each piece. The photo on the right shows one side, again, with the circles facing out, but the other one has been reversed to show the blocks on that side. The thing is, for some reason, in the kiln these otherwise flat disks “rippled” a bit around the edge. I’ve had pieces curve or warp on a larger scale, either during drying or firing, but I’ve not previously experienced small little rippled ruffles like these have. It is a kind of interesting look, it was just such a surprise to see it. Although I was able to complete those earrings in March (as I’d mentioned earlier, and they are hidden in my “summary” photo with the April 1 post), I hadn’t gotten any decent individual photos of them. I tried again today, after picking up several interesting tiles (glass, ceramic, and plastic) at the Creative Reuse shop within Construction Junction. That photo contains all 32 pieces: the thirty I posted at the Month of Earring pool on Flickr, and the two “bonus” pieces I mentioned with MoE entry #27. To see any of the 30 entries in more detail, either browse back through these posts, or go to Flickr where you can see the entire set. 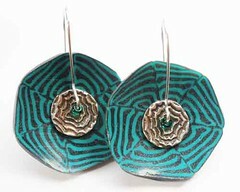 My 30th entry for the Month of Earrings Challenge!!! 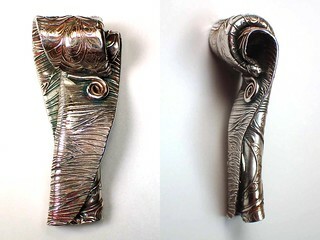 Having done a simple cylinder (posted as #28), twisted cylinder (#29), and a simple twist (#27), it seemed fitting to finish up with a flourish based on a “twisted tube” theme. Last summer, I’d made a series of “Twistie” earriengs, with a shape rather like that. They are fragile during construction: when I’d break a bit off of one, I’d then trim the other to match. And repeat that as necessary, sigh, until a few twisties ended up far shorter than I’d intended. I was also fiddling around with various ways to drill nice, even little holes to use in attaching them to earwires, without falling prey to distortion (working with wet clay) or even more breakage (once they’d dried). Though I liked the look, and they did sell rather well, I had been thinking I needed to take a different approach if I wanted to enjoy making them. Looking at the final remaining pair, last fall, I realized: don’t drill a hole at all— build a special little tube, attach it vertically, and run the wire through that! The idea’s been sitting there for several months. This, its first full implementation, seemed a good way to end this month’s challenge. No, Im not eating silver earrings. 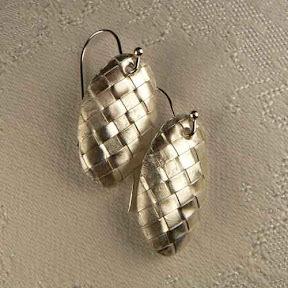 But, as I commented the other day, I sure do feel like I’m swimming in earring components. I can’t make just one earring. Not even just one pair. But now, it seems, not even one extra component when I think about how to do a piece. Noooo, one “simple” idea sparks a cluster of others. Which, in this context, is a good thing! The first pair (above) was fairly small, with a curved edge that overlaps about half of the underlying layer. With a satin finish, an ever-so-slight bit of patina along the edge is just enough to highlight to the curves. 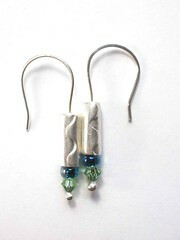 The cylinders, and the glass and Swarovski beads, are free to move on the hand-formed Argentium silver earwires. For the third pair, I again used twists around a straw. But, instead of overlapping one larger piece of clay, I made narrow strips that I twisted around a small straw. You’ve already seen that one, back in MoE #26. Back to the title of this post, then: can I just stop at the Month of Earrings challenge itself? Nooo, of course not! And that’s the point, isn’t it? Just like the challenge of stopping after you’ve eaten just one potato chip versus before you’ve eaten the whole bag of them: the trick here seems to be to take on a handful of challenges, a selective set of them, and to see what that mix will yield. A couple of days ago, as I was looking at how quickly the end of the month was approaching, and how I had a few pieces underway but not quite ready, I got to thinking that maybe I should have a back-up plan, with a few simpler pieces, just to be sure I could have 30 done by the end of the month. Made from a texture that I’ve found to look nice with a bit of “liver of suphur” patina, trimmed along one edge using craft scissors with a ripple pattern, and dried into a curved half-ring, I decided to see how these would look with more of a “satin” finish than any of the other pieces I’d made so far this month. 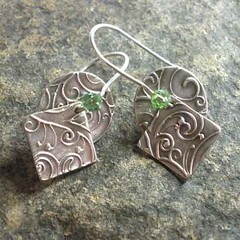 Liking the result, this is going in as an entry in the Month of Earrings challenge. What happened to the other two pairs? When I tried taking photos of them, I didn’t get any shots that I liked. With a more highly-polished surface, either I was getting either a glare from the light or, once I’d diffused that enough more, then too dark an image. I may try to capture those again later. I do have three final ones I can use for the challenge. In my own mind at least, even though the challenge was to make 30 pairs, since March has 31 days, one will go for that. And the other will go for a sort of “Baker’s Month” (as in “baker’s dozen”) bonus. 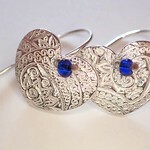 I really like the colors and shape of the four smallest cane slices that I found in the box that “Beading Heart” Barbara gave me (with which to explore designs that mixed silver with her polymer); my challenge with those four was how to work with domes of that depth. I was glad that my earlier “movement” pieces had already shown I could have the wire stretch up the back. 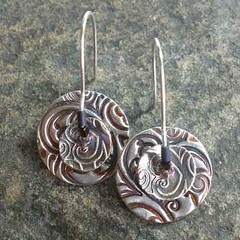 Since my last trials combining my silver work with that of Barbara’s polymer seemed to work out well, here are a few more. I think these two black-and-white cane slices are my favorites of the ones Barbara gave me. I’m glad my earlier trial with the green and black domed pieces turned out as well as they did: that made it easier for me to decide how to build those up. I’ve been talking lately with my friend Barbara (aka Beading Heart) about various ways to combine metal and polymer clays. 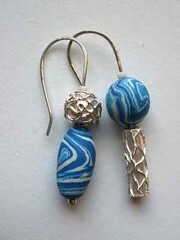 She kindly donated a few of her polymer canes to my earring explorations. 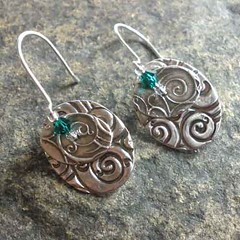 In some of the all-silver styles I showed earlier, it seemed to make a noticeable difference to the “balance” of the earrings whether the long stretch of wire ran up the front or the back. With these lightweight polymer pieces, however, it doesn’t seem to matter quite so much (though it is still good if the wires are appropriately work-hardened once you’ve got them in place). That is a useful thing to know going forward. I was happy to see that these seem to remain “upright” better than the the ones with big metal disks. 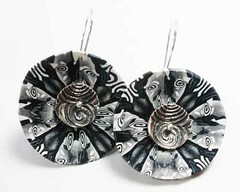 That’s good because it provides a practical reason, as well as an artistic one, for using these two materials together. This Month of Earrings challenge (I’m well into the second half now!!!) has confirmed something I really knew already: I am drawn to movement. And I’ll admit something: I had already domed those silver disks so that the texture was on the concave side (as shown in a number of my earlier entries). To get them to work for this pair, I had to put them in my dapping block and get them turned the other way. Whew: It worked! The four disks with a curve down the middle are leftovers from something else I tried last summer. (Those were OK, but I wasn’t that crazy about them, so I didn’t continue with that idea. I’d already made these four, however, so I just set them aside, knowing I’d find a use for them eventually.) What I did now was to make four more disks, flat ones, and attach them to the back. 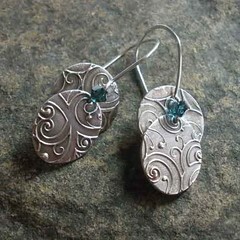 Once everything was fired and polished, I decided to apply a patina to one pair, while leaving the other as “naked” shiny silver. Then I balled up the ends of some pieces of Argentium silver wire, and started adding beads. There’s a little bit of color from the Swarovski crystals at each end. 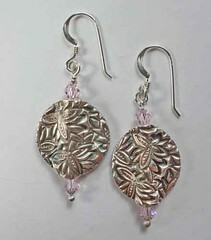 To keep those from hitting the silver, next there are little glass beads of a similar color. And to keep all of that lined up nicely and allow the silver beads in the center to spin on the wires, there’s a column of tiny (11/0) glass seed beads down the middle of each tube. It’s a shame they end up hidden, but they serve a good purpose in there. 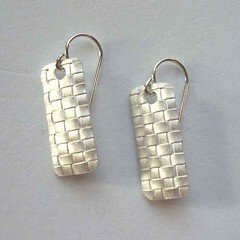 Then, the Argentium wires are finished with a wrapped loop, and hung on (purchased) sterling silver earwires. For what it’s worth, the tiny coils on the wires can spin as well, if you really want to fiddle with something that small. Continuing on the spinner-earring theme for the moment, I still like that little flat-wire spiral on the first set I made. Let me try to turn the earwire around. (Another great customer suggested that, and I was happy to be able to pull these out!. I’m using balled-up wire-ends, not the latchback design of the Art Jewelry magazine project that inspired these particular experiments, so if I put the ball in front, that can help to hold the spiral in place. For this next pair, given the design on the disks (especially the smaller ones) I didn’t think they needed a spiral in front. 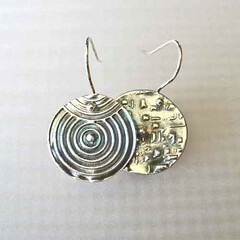 So these just have two fine silver disks threaded onto similar earwires. On the plus side, regarding my earring experiments with a spinner / movement design, I am finding that I can bend and twist the wire in such a way that the pieces do seem to hang in a nice position. But what else can I do to improve the construction process, to reduce the risk to the beads while still getting the practical effect I want from them? The look seems nice, but those particular beads have a rather large hole. Even though I hammered the wires flat, which widened them a bit, the beads do still want to ride up, and off the earwire, when you put the piece down for storage. 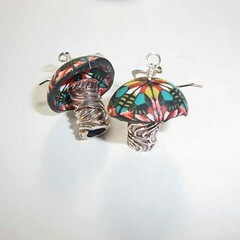 Now, I usually sell my earrings with a small rubber or plastic “ear nut” that some people like because they feel it reduces the risk of losing an earring. 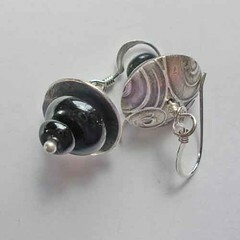 Carefully replacing that will, of course, help to hold the rose-colored bead in place when not being worn. But I prefer construction methods that don’t rely on such trickery later on. 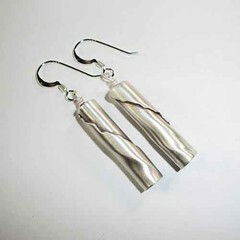 That approach appears to have a future although, in subsequent designs, I can plan ahead and make silver pieces that are a better fit with it. For an experiment though (using disks made at random during the February clay play day with my local metal clay guild), I’m happy with those. Digging through the stash, looking for the Japanese bugle beads for that, I came across a handful of small silver-lined glass beads. 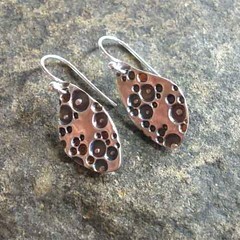 (Clearly, I’ve been interested in silver since long before I ever started working with silver clays…) They are smaller than the rose-colored ones, above, with smaller holes. 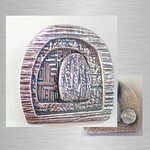 They serve their purpose of helping to hold the various bits together while almost disappearing into the design. 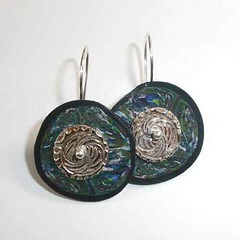 The domed earrings I entered as my first items for the Month of Earrings challenge are a variation on a project described in Art Jewelry magazine last summer. 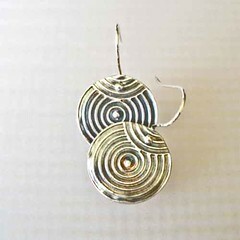 In that article, both disks were cut out of a sheet of sterling silver, then hammered, filed, and assembled with a small bead onto hand-shaped sterling silver earwires. Since I’m one of those people who rarely follows a recipe exactly, not even the first time any more, the first ones I made based on that article used one disk of fine silver and one of copper (no sterling for either). 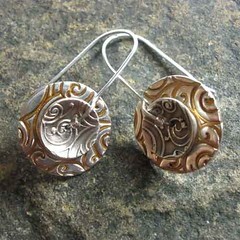 I chose to dome both of those, and then used a little flattened spiral of sterling in place of the bead. I did follow the instructions for how to make the earwires … almost! I made a small modification to the back, however, to help hold all the pieces upright at the ear. 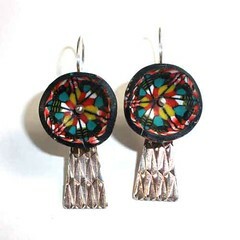 Problem is, while these pieces do hold together wonderfully while being worn, the components want to slide around on the wire when you take them off and put them into your jewelry box between wearings. Having made those, it’s (now) clearer to me why the instructions were written the way they were, and which variations affect which aspects of both look and practicality. Ah, let’s hear it for variations! 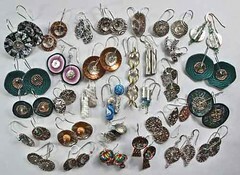 I can use the Month of Earrings challenge to explore some more of those, and see which ones do and do not work reasonably well, which ones may be even more of an improvement on the original! 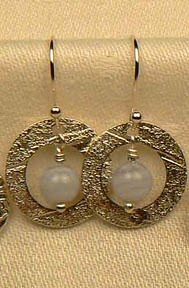 The bead in front, and the wire that bends around it, help to hold the disks in place when you store the earrings. Though I like the look of my little flat wire spiral, that didn’t have quite enough bulk to serve the same purpose. Let me try some little Swarovski crystal beads instead. I led a great little class on Sunday at KoolKat. Several returning students and one enthusiastic newcomer. 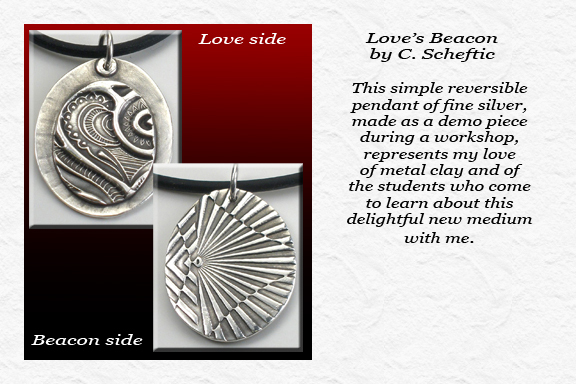 Each participant made four to six pieces that could be used for pendants, charms, or earrings. On the “second” side, we used a variety of slip-trailing techniques (with the consistency of the slip itself ranging thick to runny; using refilled syringes, a spoon, paintbrushes; etc.). On the first, we may have rolled it out with a texture, or left it smooth, or applied slip there too. 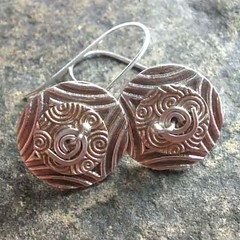 While I was demonstrating rolling, texturing, cutting, hole-making, plus slip trailing and other forms of embellishments, I was able to make several more pieces for the Month of Earrings. 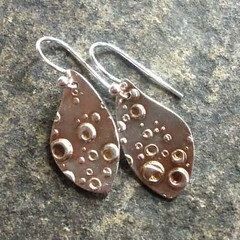 After they were fired, I applied a patina using “liver of sulphur” and hung them on sterling silver earwires in such a way that they can be slipped off (ha…) and turned around depending on which side you want to show in the front. 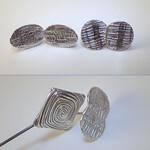 As photographed, these three pairs illustrate the sides with stamped textures. Between seeing the daughter’s clay and making the offer, I did spend one evening experimenting with polymer, just to see what I might be getting myself into. I gave some of my results to the children, and kept a few others that I’ve used here and there over the years. The blue and white beads, above, are the only ones remaining from that episode. Little leftovers, different from each other in size and shape, they have been sitting in one of my bead-stash boxes biding their time. The little round silver ball has been sitting in a silver-stash box as well. (You laugh at all this talk of stashes? Please leave a comment describing yours, dear reader!) The base was made as I was showing a friend how to work with cork clay: I make small, simple demo pieces and wait for some other opportunity to use them. Mine sat there, unfired, for months. One day when I was trying to show a student some things about manipulating a syringe full of clay, I pulled out the little ball, and illustrated my comments by decorating it. 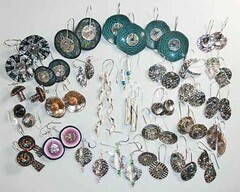 So along comes this earring challenge. I looked at those three pieces and said, the silver ball is a little smaller than the polymer one, but the three pieces do sort of go together. Make a fourth variation. Thus, the brand-new silver cylinder. When I went to put them all together, I decided I didn’t want to do the “usual” thing of putting a pair of beads on some wire, topping that with a wrapped loop, and dangling that from an earwire. (I do have some like that in the works. It’s just not what I wanted for these.) I wanted a one-piece construction: for each earring I made a headpin (by cutting two pieces of Argentium sterling silver wire and using a torch to ball up one end of each), put the silver and polymer beads on those (in opposite orders), topped each pair with a tiny white seed bead, and bent the rest of that metal into its own earwire. The flattening makes the wire too big for the little seed bead to pass, thus forcing all the beads to stay on the wire! I sure hope someone will like them enough to buy them and give them a good home. 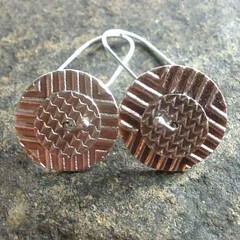 And the Month of Earrings challenge lets you go back and include anything you made since the start of the year. That is, the month is really three months long: isn’t that a delightfully generous deadline? 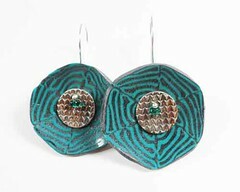 I made that pair while Tim McCreight was in town in mid-January, teaching classes at the Society for Contemporary Craft. I set that photo up so that clicking on it will switch to a page with a larger image and brief description of how these were made. 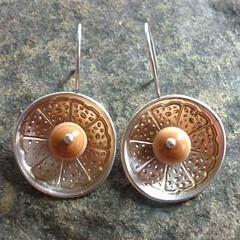 But the pair I put in for my first entry are ones I’ve already shown on this blog, talking about domes. So I thought I’d post that picture for now. One pair down, twenty-nine to go. 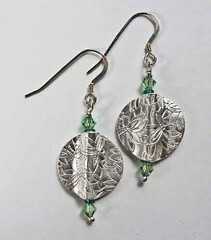 (Why) does that sound so much more manageable than two earrings down, fifty-eight to go?